Some people have major summer goals. To get that big landscaping project in the backyard done, to get the porch steps painted, to finally read your copy of Pride and Prejudice or to finally fit into that swimsuit. 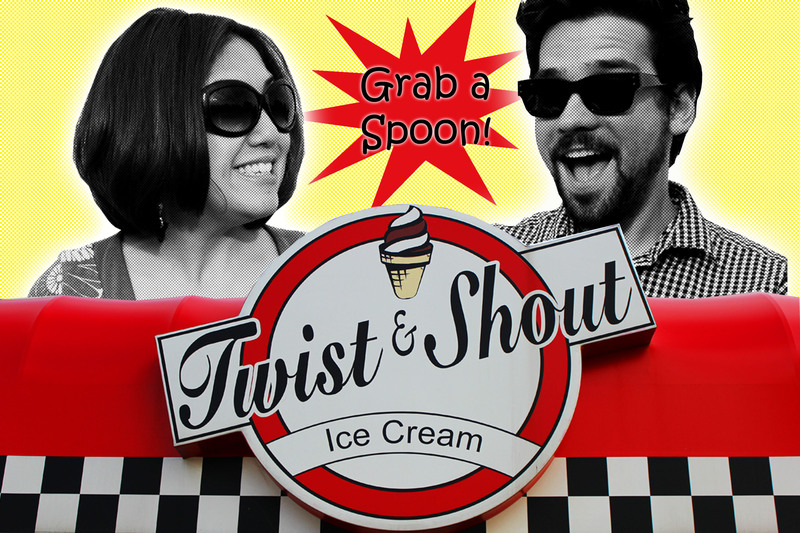 This year, my summer goal is to try all 39 flavors of ice cream from the Twist and Shout. I had never been to Twist & Shout until sometime last year. Every time we were hankering for some soft serve, we always went to Dairy Queen and I would usually get a Blizzard. But for some reason on one hot summer day, we decided to walk up to Twist & Shout and give it a try. They didn’t have Blizzards, but they had some crazy thing called Razzles. And they were better than Blizzards! Could it be? And then I saw the sign, 39 flavors of soft serve. Right then, I knew I would need to try all 39 flavors. I didn’t know when and I didn’t know how, but I knew that before I died, I would try all 39. That time has come, and that time is now. When we arrived for our first tasting, I was a little nervous. Where do you begin with 39 flavors? How do we go about this task? I figured we’d pick one “normal” flavor and one “weird” flavor and just work it like that. We will rate the flavors 0 through 5 “plastic spoons” with 5 being the highest rating. (We’re using “plastic spoons” instead of a “star” rating system.) Some weeks we’ll have to do three flavors and I’m OK with that. It’s a dirty job and someone has to do it, right? Before I get to the review of the flavors, I feel the need to announce that I’m a cup guy all the way. I used to eat from the cone all the time, but it’s just an edible handle. I find that it distracts from the real flavor of the ice cream. Call me a purist. A few years ago, I realized I never really cared for it. I gave it up completely and never looked back. Aya, on the other hand, is all about the cone. Although, I think she might change her mind after having melted Tuitti Fruitti ice cream dripping all over her hands after our first tasting. Our journey started with two flavorsâ€“Tuitti Fruitti and French vanilla. I’ve never had anything Tuitti Fruitti-flavored before. The only thing I think of when I hear that flavor is Little Richard playing the piano. How does that transfer to an ice cream flavor? I was expecting more of a zangy strawberry flavor I guess, but after taking my first bite and letting it sit on my tongue for a moment, I couldn’t help but think of a pink polar bear eating a Gobstopper. It had a strong sugary candy flavor, like a Gobstopper, or Nerds. It was an unexpected flavor to come from ice cream. Aya didn’t like it much, and to be honest, it wasn’t my favorite either. But neither of us are big fans of that type of candy. So if you like sugary sweet candies in ice cream form, this may be just for you. Both Aya and I rate this flavor at 2 Plastic Spoons. From what I hear, some people are vanilla snobs and judge all ice cream based on how their plain vanilla is. I’m not that particular about that since I usually like my ice cream goobered up with all kinds of fixins. I consider vanilla to be a just base to build on.Â But for this purpose, we ate it plain. The fact it was French vanilla and not just vanilla gave it an edge. It was vanilla with a hint of something extra special. After taking my first bite, I thought I heard a French guy over my shoulder laugh, “oh-hoh-hoh-hoh-hoh-hoh.” It was smooth, it was creamy and it was cold. It didn’t have ice crystals in it or a weird texture. I think it’s one reason their Razzles are so good. It’s a good solid base to build from. We both rated this at 5 Plastic Spoons. Tune in next week for two more flavors. Or maybe even three!